Who speaks for climate? Making sense of media reporting on climate change. INSTAAR Noon Seminar, March 19, 2012, Boulder, CO.
Visualizing Climate Change: International Perspectives on Adaptation and Mitigation. Eco-Images: Altering Environmental Discussions and Political Landscapes, April 18, 2012, Munich. (with Lisa Dilling), Climate Change Session. 2012 World Renewable Energy Forum, May 15, 2012, Denver, CO. Rhetoric of Climate Change Deniers. CU Boulder Program for Writing and Rhetoric Seminar, May 16, 2012, Boulder, CO. The dynamics of vulnerability: Why adapting to climate variability may not always prepare us for climate change. Poster presentation. Climate Adaptation Futures, Second International Climate Change Adaptation Conference, May 29-31, 2012, Tucson, AZ. 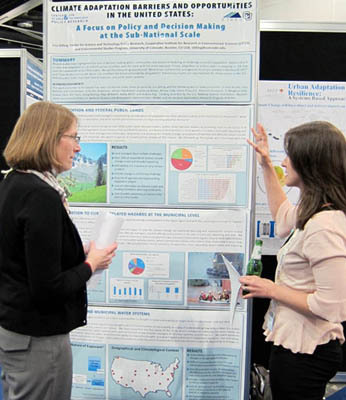 Climate Adaptation Barriers and Opportunities in the United States: A Focus on Policy and Decision Making at the Sub-National Scale. Poster presentation. Planet Under Pressure Conference, March 26-29, 2012, London. Local adaptation strategies: Perceptions and responses to hazards by municipalities in Colorado, Wyoming and Utah. Scales, Frameworks and Metrics conference, ICARUS III, May 18-20, 2012, New York. (with Meaghan Daly), The Dynamics of Vulnerability: Why Adapting to Climate Variability May not Always Prepare Us for Climate Change. Scales, Frameworks and Metrics conference, ICARUS III, May 18-20, 2012, New York. Evaluating Success in Climate Adaptation Science and Practice panel, and Successful Adaptation to Climate Change: Linking Science and Policy in a Rapidly Changing World panel. Climate Adaptation Futures, Second International Climate Change Adaptation Conference, May 29-31, 2012, Tucson, AZ. Knowledge production for sustainable development workshop. Maastricht University, April 12-13, 2012, Netherlands. Lessons from 50 Years of Science Advice to the US President. Berlin-Brandenburg Academy of Sciences and Humanities, April 17, 2012, Berlin. Extreme events: Pacemakers of adaptation? Climate Adaptation Futures, Second International Climate Change Adaptation Conference, May 29-31, 2012, Tucson, AZ.